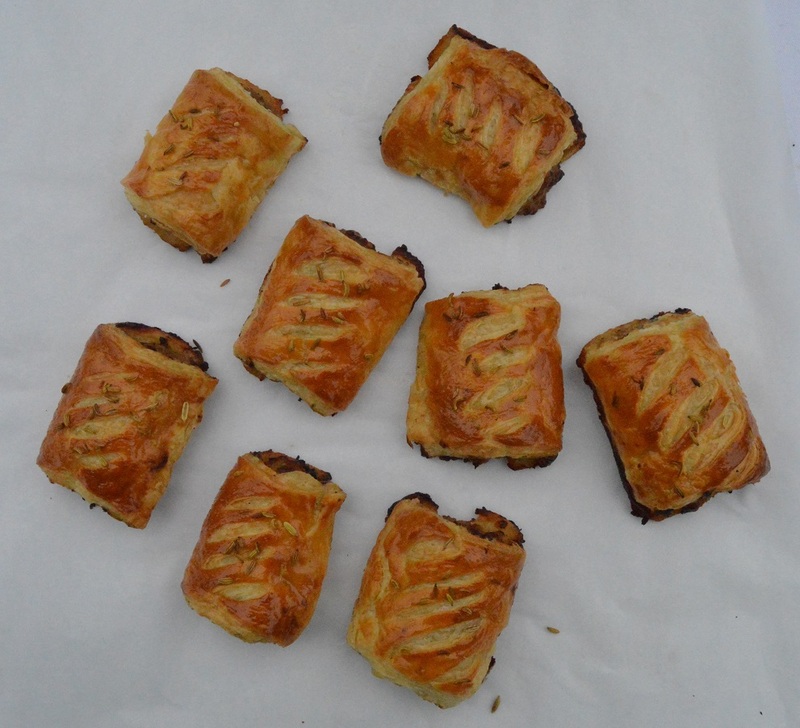 Rather than go for full-on chorizo sausages encased in pastry I added some finely chopped chorizo to the sausagemeat filling that I always use for my sausage rolls. Now I love chorizo, but not in hefty quantities you would have if you just encased chorizo in pastry! The pastry is the quick and easy rough-puff that I often make, and appears in several other of my recipes. 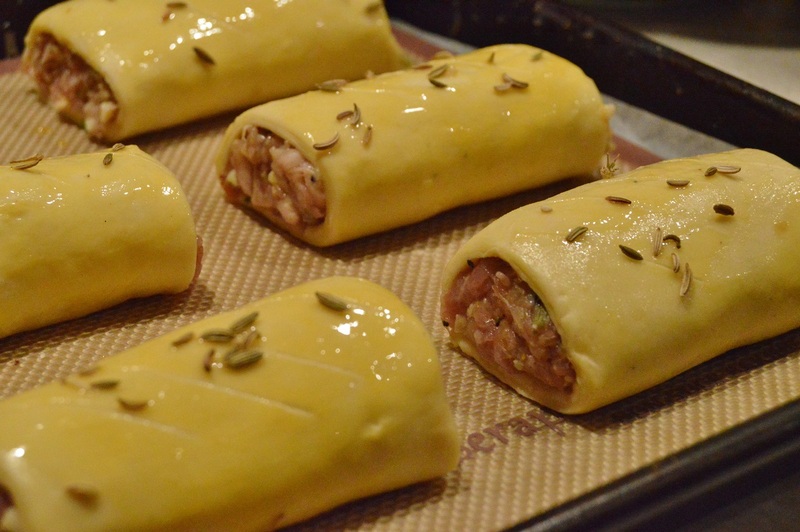 It is very light, quite easy to make and tastes excellent: and makes the pastry component of a sausage roll more than just the thing that holds it all together! 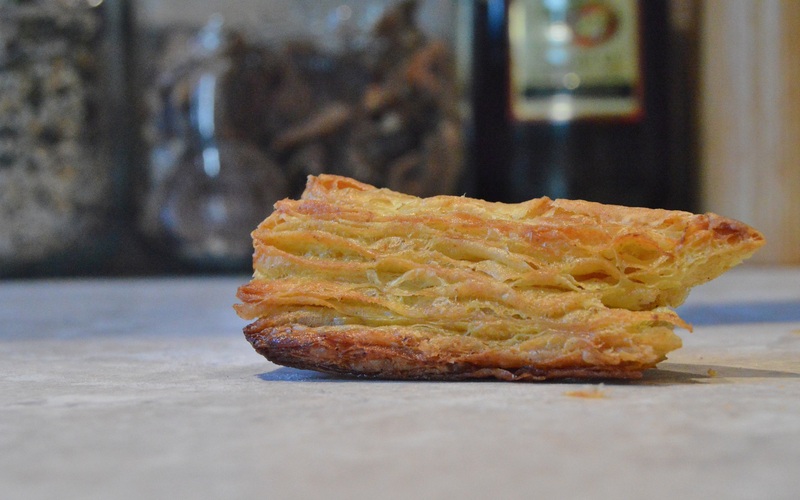 You can of course buy puff pastry, but if you do, I implore you to buy the all-butter variety and not the cheaper stuff that has oils on it: the pastry made with oil really does not have a nice taste at all. I vary between making a smoked paprika rough-puff pastry, which works wonderfully, or using fennel powder for the pastry: you can use either, or even a combination of paprika and fennel powder. I often flavour my pastries depending on what they are being used for (cocoa, fruit powder, mustard powder, turmeric, curry powder are favourites of mine!). For these, I used the wonderful fennel powder which complements the chorizo and the pork wonderfully. I used the wonderful fennel powder from Absolute Spice: it really is such a quick, tasty way to get a nice depth of fennel flavour into bakes. I go for 3 turns here which gives enough lightness and flake for what I am after here. You can do the 3 turns one straight after the other without chilling the dough in between each turn, but you do need to chill the dough for at least 30 minutes after the final turn (ie: before you are ready to use the pastry). If the pastry is resisting while being rolled out at any stage, fold it up loosely, pop it in a plastic bag (or wrap in clingfilm) and chill it for 20 minutes or so before continuing: you will notice that it will have relaxed significantly, allowing you to roll it out with ease. A chilling after the 3rd and final turn for at least 30 minutes before rolling it out ready for the filling makes it easier to roll out without putting pressure on the pastry. (1) For the pastry, mix the flour, salt and fennel powder together. Stir in the chopped butter and coat with the flour mixture to stop the butter clumping together. Stir in most of the water with a knife to form a soft but not sticky dough, adding the remaining water if necessary. Bring together to a ball without kneading it. Ideally chill it at this stage for about 30 minutes, but you will still get great results if you proceed immediately to the turns. (2) Roll out the dough on a floured surface to a long, narrow rectangle (I don’t tend to measure but the batch I did here went to about 20cm wide and 50cm long). Fold the bottom third into the middle and then the top third over the centre. Give the dough a quarter-turn: this is the first turn. Repeat two more times. NB: it should roll out quite effortlessly without the need to put much force onto it. The dough will look streaky to begin with but the streaks will disappear with later turns. (3) After the final turn, you do need to wrap the dough in clingfilm and chill for at least 30 minutes – or freeze it at this stage for later use. (4) Mix the filling ingredients together and set aside until needed. (5) Cut the dough in half and roll each to a long, thin rectangle. Place the filling down the centre, brush one of the long edges with beaten egg and bring this up over the filling and seal, giving a long cylindrical roll. Pinch the seal well and turn over the pastry roll, so the seam is on the bottom. (6) Brush the top of the pastry roll with egg and sprinkle over a few fennel seeds. Cut into whatever size you want and place on baking sheets lined with parchment or silicon sheets. Chill for 20 minutes or so (gives an even better flake) and then bake in an oven preheated to 190C(fan) for about 20-25 minutes. 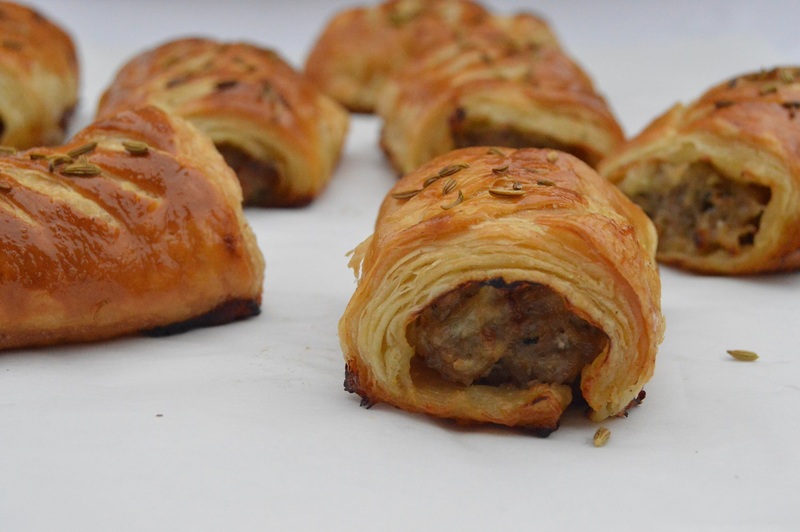 Delcious sausage rolls. Love your rough puff pastry recipe. thank you. And there is always something intensely satisfying about making and eating rough puff pastry! thanks Ronit. Yes, fennel is a lovely flavour with sausage and works well here. And total comfort food! !